A journey can be for either or both of these reasons. 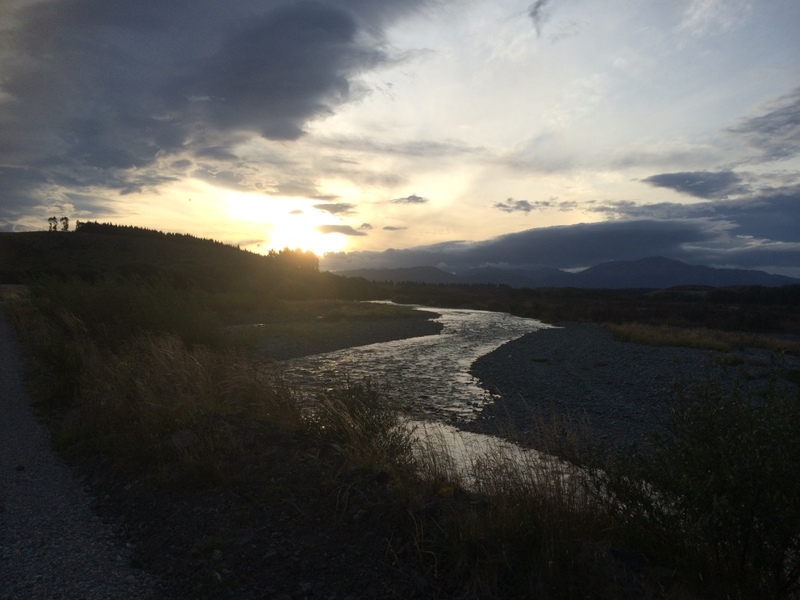 When I went to New Zealand to cycle, my journey was about having a good time. That’s it. In short, the reason I stopped cycling in New Zealand so quickly was because I wasn’t having a very good time. I believe that I could have continued for several weeks to complete my proposed ride – I have endured under more difficult circumstances, but I didn’t want to endure for the sake of enduring. Instead, I chose to explore in a different way, a way that would be more enjoyable – starting with seven people in a van painted like a cow. Why was my ride so cycling unenjoyable…? A few minutes before we started our journey, the skies opened. It poured down us all day. The next day the wind limited us to a max speed of around 15km/h, often closer to 10km/h (compared to 25-30km/h without the wind). It was frustrating and at the end of the day we were rewarded with a wet tent. For the next couple of days, the rain ceased to halt and our reward for cycling each day was a cold, wet tent, our bodies struggling to get dry. I don’t mind cycling in the rain, but being constantly cold and wet is not particularly enjoyable, especially when we weren’t equipped for such weather. The weather forecast (shown above) was a genuine forecast of a place we passed through and much of our intended route along the west coast would be passing through similar weather. When I was in New Zealand a decade ago, I felt I could sleep wherever I wanted and the general cost of living was moderate. Since tourism in New Zealand has gone through the roof, prices have skyrocketed – a bungy I did for around $70 is now priced at $169. In 2011, in anticipation of the 2012 rugby world (so I have been told), the ‘Freedom Camping Act’ was introduced which (in an abstract way) largely prohibits free camping (with the exception of when in a self contained vehicle – translation: a vehicle with a toilet). As our bicycles didn’t have toilets, this meant we were supposed to camp in designated campsites (which cost $25 per person in Queenstown and other popular places) for fear of facing a $200 fine for violating the free camping rule. Despite this, we free-camped where we could, but found ourselves searching low and high for places to camp as the roads / cycle tracks were largely surrounded by barbed wire fencing, prohibiting access. It is possible that this would have changed, but after 250km, we felt very restricted and that we were being forced to pay more than we hoped when we came on this journey. The barbed wire fences also meant that we couldn’t explore freely as we had originally hoped. New Zealand was popular last time I came, but not this popular. The roads are very busy, making the cycling much less fun. I don’t enjoy cars constantly racing past at over 100km/h and we were vey nearly hit by a bus at a crucial point in our journey which put me on edge. Is a bicycle ride worth dying for? Not this one. Even when we tried to find a legal place to stay such as a campsite, we had great difficulty. 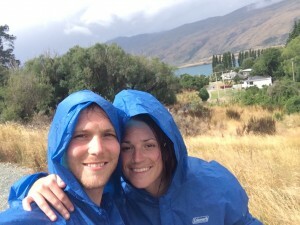 In Queenstown (admittedly one of, if not the, most popular town in New Zealand, we paid $175 for seven of us to camp on a patch of grass that was about four metres wide as it was the only place available – the next night, with no other option, we slept in a car and got in trouble for it). Sometimes things just go wrong. I have fond memories of New Zealand (from a decade ago and this time around), but during the cycling, we got unlucky. It started going wrong in Christchurch and then deteriorated. Rather than clinging onto something that wasn’t working out, we decided to change our journey. 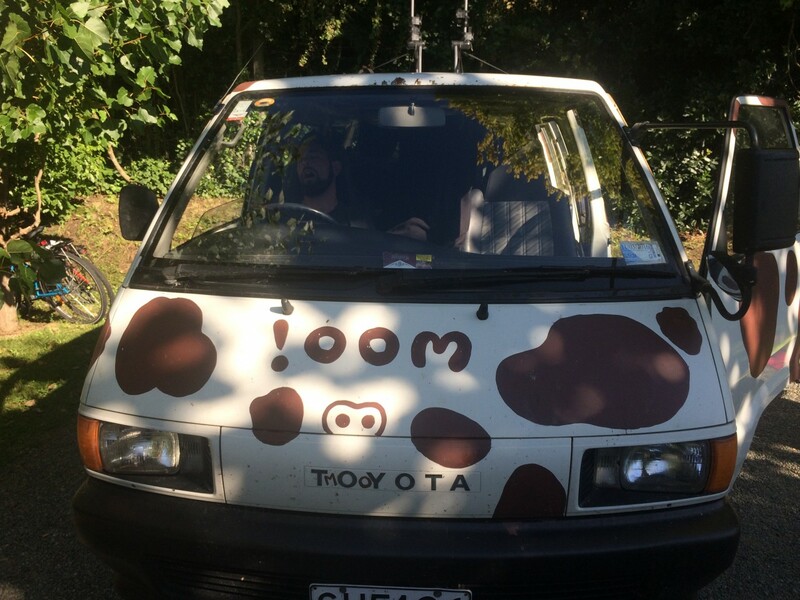 Since abandoning the idea of cycling in New Zealand we did a little volunteering (that ended quicker than intended as things didn’t work out) before joining some friends in Mootilda, a van painted like a cow. If you have ever seen Mary Poppins with her magic bag, you will appreciate this van. Seven of us are squeezed in to the little two-seater. It’s been a lot more fun than our unfortunate cycle ride thus far and we have finally caught up with some sunshine by heading north. Eeeeeek, we are flying to Queenstown in a week for 6 weeks of cycling in the South Island. Have you tried asking property owners if you can camp on their land? No, we didn’t, but I am sure it would be possible. It was the weather that really got us down, but we were unlucky with exceptionally high rainfall.